Disney gave a good look at the much-anticipated, live-action Aladdin over the weekend. The teaser gives a quick look at familiar characters like Aladdin (Mena Massoud), Jasmine (Naomi Scott), and Jafar (Marwan Kenzari). 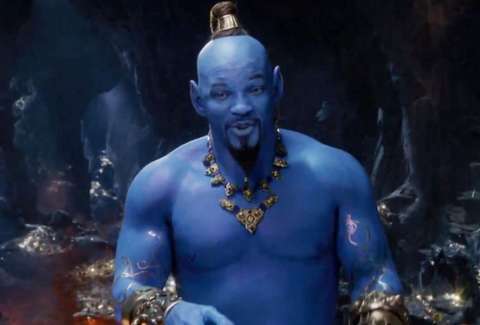 However, while he's not the star of the story, everyone has been looking forward to a look at the Genie, which will be played by Will Smith. Just like in the animated version, you're getting a big blue genie. People have been curious if Smith could pull it off because Robin Williams set the bar pretty high in the animated film. No one probably thought that hearing the Genie talk would be both unsettling and somehow make you think of the Fresh Prince of Agrabah. Naturally, Will Smith's Genie was meme'd upon arrival. There was no doubt this was coming. Fans and detractors came up with some good jokes, even if the vast majority of the jokes involved Tobias Fünke of Arrested Development and his brief non-stint with the Blue Man Group. Here are some of the best Aladdin memes, and, below that, the trailer for the film. Aladdin will be released on May 24. Of course, there are plenty of good ones that have nothing to do with Tobias, even if there are a lot of jokes about Avatar 2. Here's the teaser for Aladdin.